Well, last night, since nobody was home, I decided to venture into my basement and pull out the holiday décor. After a very grueling 30 minutes of hauling boxes up the basement stairs, I was finally ready to sit down and begin the ritual of sorting through the holiday decorations. It’s amazing how many happy memories that floods you when you’re sorting through items you haven’t seen in at least a year. I found many homemade gifts that were made for my husband and me by our children. Shells painted with holiday cheer, paper Mache decorations with loving notes and I can never forget, the infamous spaghetti necklace. Now that was a long, long time ago. As I was taking out the last of the homemade gifts and decorating them around my house, I finally came to my box of special ornaments. This particular group of ornaments has a very sentimental meaning to me. It is my collection of Swarovski Special Edition Holiday Ornaments. There is a new ornament made for each passing year. Many years ago, when our children were small, my husband and I decided it would be best not to buy each other gifts at the holidays. We were already strained trying to raise 3 children and most of our money went to living expenses, or the children. My husband has always been a very proud man. He has always done his part to ensure that our children had the best holiday they could possibly have. He would work many; many extra hours to make sure each of his children got that one special gift they had asked for. I have to admit, he never once failed in his quest. On one particular year, after the children had opened their presents, I noticed there was another small gift stuffed between the branches of our tree. Puzzled, I walked over to see whom it was for. To my surprise, it was for me! As my husband looked up at me sheepishly, I opened the box. It had to be the most beautiful crystal I had ever seen. It was a 2000 Swarovski Special Edition Holiday Ornament. I could tell from looking at it, it was expensive. I asked him, “Why would you buy something so expensive for me?” He said, “ To see the happiness on your face when you opened the box.” I was beyond surprised and amazed that he purchased such a beautiful, thoughtful gift. Feeling a little less than thoughtful myself, I said, “But I didn’t get anything for you.” He looked at me in surprise and said “Yes you did. The happiness on your face is the best present you could ever give me”. (I got to admit, he really is a great guy). 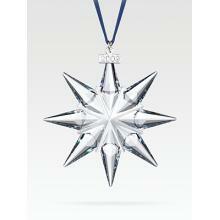 Every year since that day, there has been a box with a new Swarovski Special Edition Ornament for me under our tree. He has bought me one every year since that day. (And I make sure I have a present for him too.) It always makes me smile and has become my most favored tradition. Well, that’s all for now. Until next time. It’s me again, Laurie, the gadget Gandhi of consumer products. This product review brought me down a different path than usual. It is an item that I think should be something that we should all think about. SERIOUSLY. My product for today is the “Stay Safe Rescue” Breathalyzer. I hate to bring up stuff that is depressing, as I myself always try to keep a positive outlook on life. You know, best foot forward. But I came across this horrible news story this week that I thought I should share as I feel it relates to this product review. An unfortunate young woman who was riding on the back of a motorcycle around 3am had fallen off the bike and died. What a horrible story, right? The young man who was driving the bike had told police that he had previously left a bar with the young women. He knew the women’s first name only as he had just met her that night. Police were working on trying to identify her. Now, is that not a horrible situation? So here is where I have issue. If you were intoxicated or even a little tipsy, why would you get on the back of a motorcycle? I’m not fond of being on the back of a bike sober, so I could never fathom getting on the back of a bike after having a few cocktails. I would consider that action insane! I consider myself a social person. I am regularly attending some sort of social event, may it be a cookout, cocktail party, bridal shower or whatever. What I can attest too is there is usually alcohol served at all these functions. The thing that astounds me the most is how many people insist, after having a few cocktails, that they are OK to drive. You don’t have to be falling down drunk to be over the legal limit to drive. So, how do you know for sure when your friend has or has not had too much to drink? Well, I came across this product that will put an end to the guessing. ReSource Inc. has developed an FDA Approved Alcohol Breathalyzer called Stay Safe Rescue. The Stay Safe Rescue is small enough to fit in your purse or tuck away in your pocket. You simply press the CAL button on the front. The unit will count down from 5 to 0 with WAIT flashing on the display. While the 0 stays on the display, you blow into the inhaler for 3-4 seconds. Simple as that, now you have a reference. (I would recommend 2 readings to get an average) Use this product only as a reference as all items have their margin of error. It will however give you a reference to think about prior to doing anything stupid like driving. Most people do not realize that more than 1 drink per hour will put you over the legal limit for driving. Men also metabolize alcohol faster than women. Sorry girls, it’s a fact, the alcohol effects us faster. The item retails for $54.99 and is well worth the investment for anyone with a social life. They have a cheaper item, Stay Safe Advantage, for $34.99. The Stay Safe Advantage does not have FDA approval. I would truly recommend owning this item. I always recommend to Stay Safe. These products will be release in 2010. I will keep you posted on where to buy as soon as they are released.